Halibut was not a staple on the Glen-Mor Restaurant menu, but halibut steaks were served occasionally when available from the fish vendor. 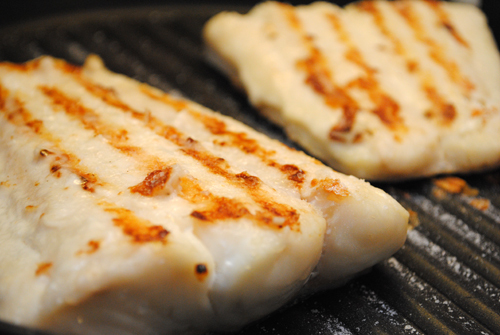 I didn’t find halibut steaks at the market, but instead cooked halibut fillets. The preparation is similar to Broiled Swordfish and the result is an easy weeknight meal. Place a oven-safe grill pan in the oven and preheat the broiler on high. Remove pan from oven and place on stovetop. Place the halibut in the center of the pan skin side down. Spread 2 tsp. of mayonnaise on top of the fish and sprinkle with 1/4 tsp. salt. Return pan to oven and broil for 5 minutes. Remove pan, flip steak and sprinkle with remaining 1/4 tsp. salt. Return to oven and broil for an additional 3 minutes. Remove from oven and check if fish is done, it should flake easily with a fork. Remove cooked fish to cutting board and cut into 4 equal pieces. Serve immediately.